We will be adding a few new resources that we hope will be helpful for our newer schools and schools who don’t have a development department. 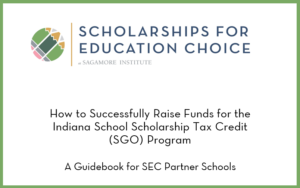 Be looking for our new Communications Toolkit and a booklet entitled “How to Successfully Raise Funds for the Indiana School Scholarship Tax Credit Program”. They are getting uploaded now! We would love to have your sample SGO Communications. Please send your examples to Laurel at laurelc@sagamoreinstitute.org. We’ll get them loaded into the new folder – thanks! !